Happy Meteror how to transform Customer Happisfaction. 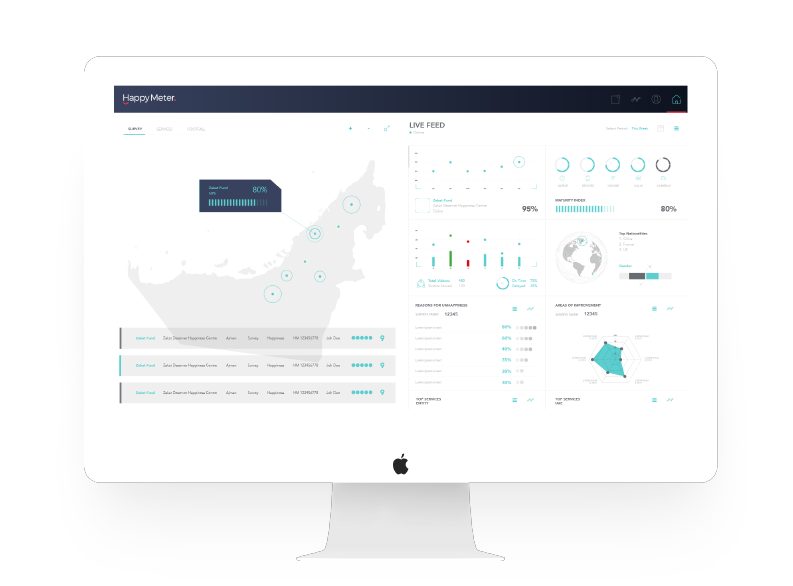 Loyaltio Happy Meter is a real-time platform that provides organizations and public institutions with a 360-degree view of the customer experience. 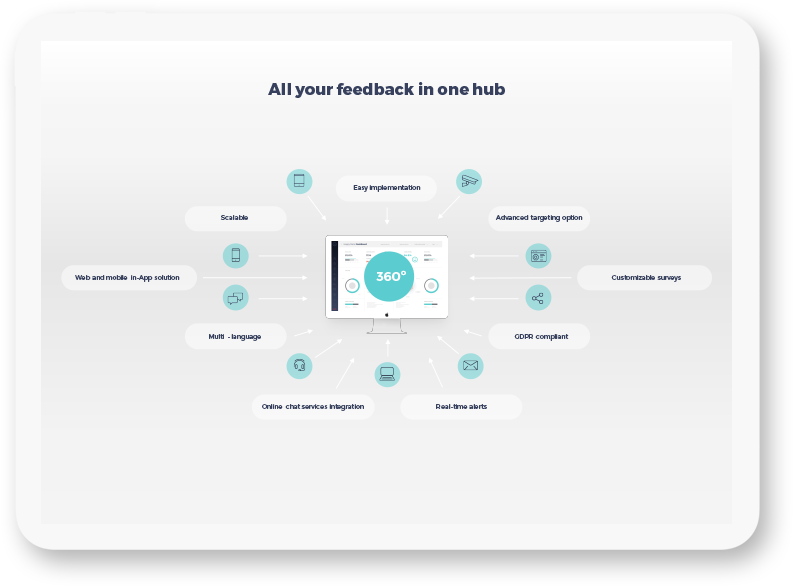 Engage with your customers through one single platform and collect their live feedback across multiple channels (offline and online). 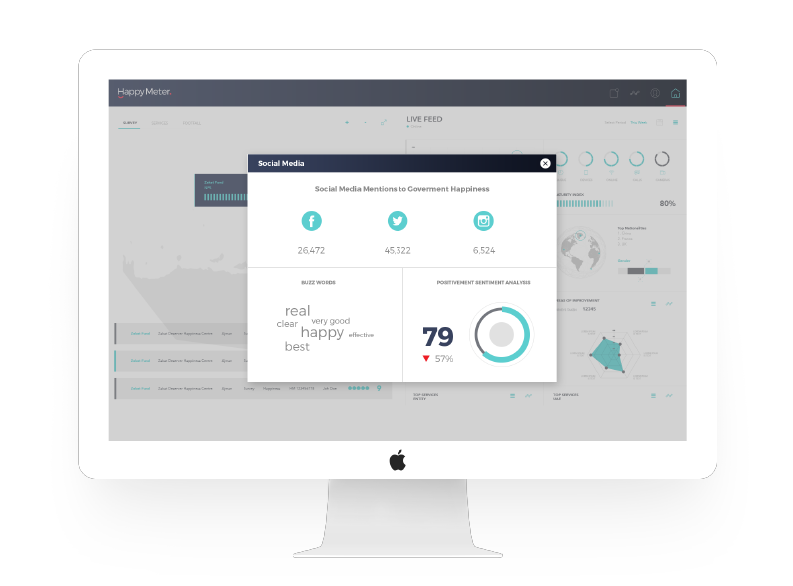 Understand what your customers are saying by means of the Happy Meter platform analytics, reporting and visualization tools. Understand your customers’ specific needs and get insights on the organization’s blind spots and areas of improvement. Address the organization’s issues both by taking immediate action to correct occasional issues and by implementing mid-term policies that will improve customer satisfaction and increase loyalty. Empower the organization’s employees to share their feedback and be proactive in the issue management. Follow up on your customers’ suggestions or complaints, promoting the best ideas and implementing them in your organization. Track the impact of changes in time so that your organization will be able to forecast and anticipate new customer trends. 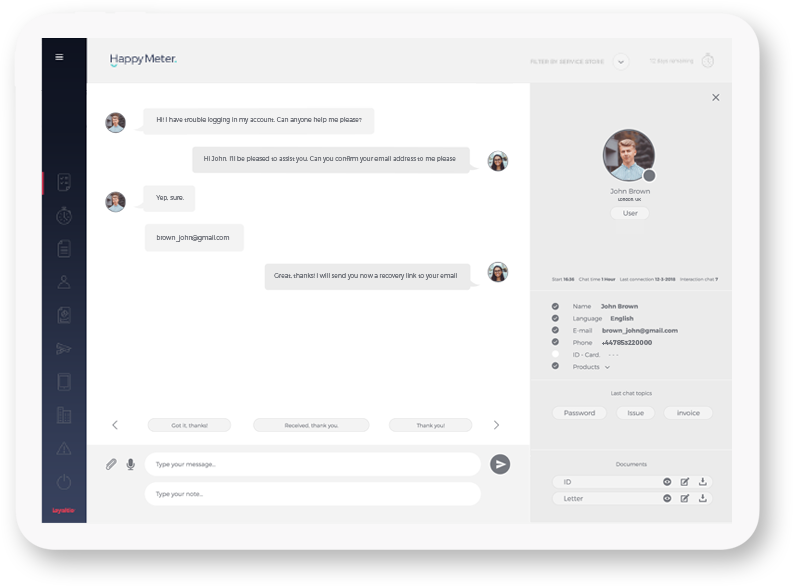 Gain a 360º view of the customer experience by gathering live feedback through multiple channels such as tablets, web and mobile app widgets, call centres, email, SMS and chat. Measure your company’s performance and empower your employees by allowing them to give their personal feedback and share their knowledge about CX based on customer interactions. Also, make comparisons between the different facilities, departments or areas of your company. Be aware of what your customers need, by accessing to a unique simple hub that shows you all the data collected in an enterprise dashboard. Analyze the main KPIs related to customer experience and give access to your decision-makers to reports that alert them about the issues to be addressed. 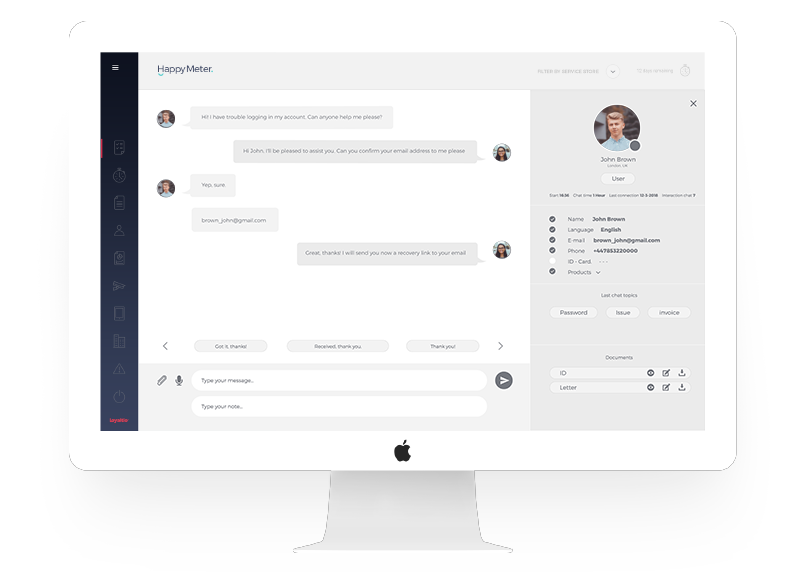 Communicate with your customers with instant messaging system and apply their feedback in real time to correct situations or integrate positive feedback and increase the customer satisfaction. In parallel, track all issues internally with the platform’s issue management tool. Identify systemic problems in your organization and implement mid-term policies that will improve the customer experience. Our multi-language platform is scalable, with flexible configuration and easy to implement. 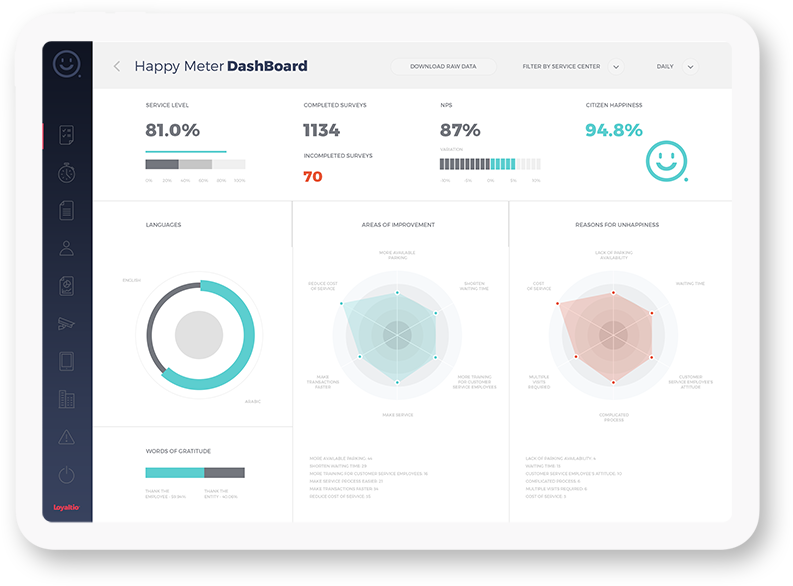 Happy Meter complies with GDPR and data security regulations. Additionally, it can be easily integrated with your company's own systems and third party applications. For more information about Happy Meter or to request a demo please contact us.